While mental health is slowly becoming more and more accepted in day to day conversation and people are finally starting to realise the severity of mental health problems, there's still an extreme amount of statements thrown around in conversation and on social media that just shouldn't be said to someone with mental health problems. Potentially one of the worst, yet most common, things that can be said to someone with mental health problems. I don't really need to go into detail about why this is wrong, just don't say it. You have no idea how someone's mental health is affecting them and their day to day lives. Oh I forgot, your definition of unwell probably means being physically ill; a broken bone or a sickness bug. Just because you can't see the illness, doesn't mean it's not there. It's 2018 and taking time off of work because of mental health is still not thought of as being the same as taking time off for a physical illness. Absolutely ridiculous, if you ask me. I have experienced so many people around me claiming that they have OCD just because they hoover a few times a week or have a certain routine when tidying the house. Hun, that's not OCD. OCD is debilitating, paralysing and you certainly wouldn't be boasting about having it like it's some sort of prize. "A good nights sleep will help"
Damn, you've cured me. I'm cheered up. Unbelievable. Fascinating. Ugh, no. I find this one of the most condescending things that a person can say actually because they don't have a clue what's going on in your life, they have no idea what's going on in your head and they have the audacity to tell you to just 'cheer up'. Wow. For me, I'm incredibly aware that the things that I'm anxious about are often irrational and that makes me feel even worse that I'm so anxious about them. So, to be honest, you sitting there telling me people have it worse just because you can't see what is going on in my head isn't going to really make me feel better, is it? I'm aware that other people have it worse but that doesn't mean that I have to pretend that my life is perfect. 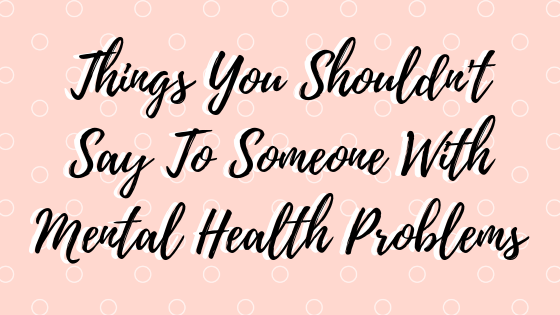 What do you think is the worst thing someone could say to someone else with mental health problems? Let me know!